There is a lot of attention being paid to bullying. I see many bullying prevention programs in media reports, research studies, and in efforts in various places to prevent and reduce the action of bullying. I also see frequent headlines about inappropriate abusive coaching tactics. Bullying seems to be accepted, or even expected, as status quo when perpetrated by sport coaches. Many coaches act like bullies and people seem to write it off as something that coaches are supposed to do, and even something that helps performance. Somehow people think that if a coach makes an athlete angry, the athlete will play better or more intensely. This has the potential for negative consequences and, more importantly, is a myth. “Sport psychology research shows that anger does not enhance performance; neither is sport participation a convenient outlet for it. But many coaches and athletes believe that angry players intimidate others and play better. Once anger is generated in competition, no one seems to know the best ways to control and diffuse it during and after the game” (Murphy, 2005). When players get angry, there is likelihood for more mistakes in play, more penalties, and arousal levels that detract from performance. Practice makes improvement. We know that practicing techniques for sport leads to improvement. Let’s expect coaches to practice being good coaches. Let’s expect both coaches and players to practice managing emotions. Role playing how to manage emotions is effective. If we can do drills for free throws, we can do drills for managing emotions. It just takes practice. The culture of sport coaching needs some work. Our expectations of coaches and our understanding of what is effective in terms of helping athletes perform at their best can be improved. Behaviors such as yelling, insulting, and displays of anger do not help performance, and could be considered lack of control of emotions. This seems to be part of the culture of sport coaching. As parents of youth playing sports, what can you do to make a difference in the culture of sport coaching? Recognize that coaches are accountable for their behavior. If you see or hear a coach acting abusively (yelling, insulting, using fear tactics to “motivate,” using physical punishment for “mistakes,” etc. ), speak up about it to the coach. If the coach denies or minimizes the behavior, bring it to the attention of an athletic director or someone to whom the coach answers. Talk with other parents and enlist the support of them as well. 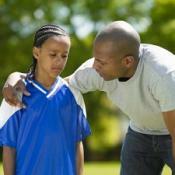 Encourage youth to speak up to coaches when abusive behavior occurs. Back them up when they do. This is tough because coaches hold power over play time and may not be accustomed or open to their methods being questioned. If you and your child work together in your own relationship to identify what is helpful and respectful behavior between adult and child, this can serve as a model for what your child can expect from other adults and give him/her confidence in addressing inappropriate adult behavior. Pay attention to your own beliefs about effective coaching. If you think it’s ok for coaches to act as bullies, why? If you think that you had coaches that acted that way and that you “turned out okay,” maybe consider that if you had coaches that were supportive and were using methods that are truly effective in eliciting best performance, your experience could have been so much better. Do you want the best experience possible for your child? Request that there be a preseason meeting between the coach and all parents: This gives the team of parents and coaches an opportunity to discuss expectations and goals for the team. If the coach says there is no time for a meeting like this, it may be helpful to suggest that if the coach really has the best interests of the athletes in mind, that he or she will make the time to hold this meeting. If everyone is on the same page at the beginning of the season, it is easier to address conflicts when they arise. 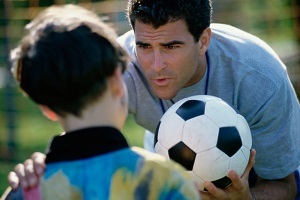 Have dialogues with youth about their relationships with coaches. Instead of focusing on their skills, spend some time asking how the coach treats them, what they like about their coaches, and whether they find them helpful? If kids are afraid of coaches, exhibit anxiety and stress going to practice, or complain about coach behavior, take it seriously. The relationships between athletes and coaches are significant and can have long-lasting effects not only in the practice of sport, but in life outside of it. Remember that youth sport is a platform for learning and fun. 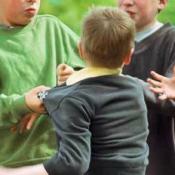 If adults involved in the sport culture act like bullies, use inappropriate means to motivate, harm children in subtle or explicit ways, or are involved for reasons other than youth development and bringing out the best in the athletes they serve, then parents and observers have a responsibility to act. Coaches have power, but so do you. Murphy, S. (2005). The Sport Psych Handbook. Human Kinetics: Champaign, IL. This article should be posted in china. with all the young ‘prodigies’ there in sport it is not I fathomable that they may have camps similar to what east Germany had in order to gain ‘national pride’! If my child is ever on a team with a coach bully, then he is off immediately! I don’t treat my child that way and I am sure as heck not going to allow some stranger to belittle him just to be a part of a sports team! Coaches need ethics. Sports is not enough. I remember my coach yelling at us in highschool. Football was my love and I took no offence to his yelling because I loved the sport and he was like a legend in school. But one time it was way too much, he was being extremely disrespectful and I just told him to go take a hike. I may have lost my place on the school team thanks to this (can never quantify how better you are than your replacement) but at least I held my head high when I walked away that day.